1 - Direct Drive with four Binary Coded Decimal inputs for each digit. This allows for easy programming, but requires 16 P.L.C. outputs. 2 - Multiplexed Drive with four common Binary Coded Decimal inputs and one input for each digit to control the latching. Thus, only eight P.L.C. outputs are required for the first panel meter and four additional outputs for each subsequent device. (Multiplexing is by digit.) For large systems other more efficient multiplexing schemes are available. As accessories for the ribbon cable versions we also offer 10 & 26 way D.I.N. Omega Rail Ribbon Cable to Terminal transition boards and Ribbon Cable assemblies. 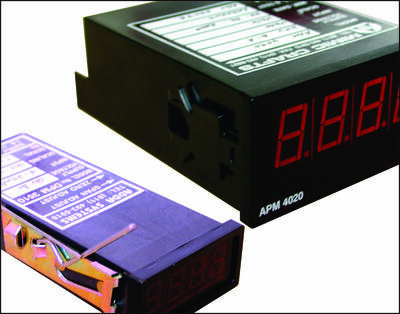 To "special order" ADDA SYSTEMS can also supply these units with 5V, 12V, 15V or 24V supply voltage and logic levels.